Some SMART opponents have been arguing that the SMART train will cause massive traffic congestion along its route whenever it closes the crossing gates. The idea is that SMART will run most often at rush hour, when our roads are busiest, and that it would cross over some fairly busy roads at grade. The crossing gates would close for a time, backups would result, and rush hour would be ruined for everyone. This analysis deserves examination. 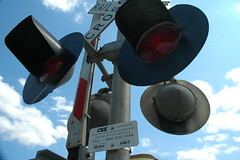 Federal guidelines on the subject require crossing arms to close at least 20 seconds before a train passes, and open no more than 12 seconds after the train has passed. Though most crossing arms I’ve seen open almost immediately after the train has passed, let’s say the gate will be closed at least 32 seconds. If a 170-foot SMART train is moving at 25 miles per hour, or 37 feet per second, it will clear a 35-foot wide intersection in less than 6 seconds. If it’s slowing to a stop, such as around Fourth Street in San Rafael, it might travel at about a fifth that speed, and will cross the same intersection in 28 seconds. SMART’s design documents say it will run at the same speed as parallel streets, so these are reasonable speeds to assume. Added these times to the minimum closure time and we find a maximum an approximate wait delay of 60 seconds, roughly the same amount of time as a normal traffic light. Thanks to long headways, each grade crossing will have to endure, at most, 60 seconds of delay twice four times per hour. In the populated areas SMART will cross through, the crossing arms will communicate with with the rest of the traffic light system. That will further minimize the effect of the train’s activities on local traffic flow. It seems, then, that the concern is overheated. While freight trains extending thousands of feet in length would cause major congestion, the relatively short SMART trains will be speedy enough so as not to cause a problem. With intelligent traffic engineering, they won’t be any more of a pain than traffic lights are now. The mathematics of maximums and minimums would suggest that adding minimums up yields a minimum wait, not a maximum wait. To get a maximum wait, you would have to add maximum parts. – we’ve never seen any analysis of the impact the train will have on downtown San Rafael traffic (not in any EIR) which defies belief. Your hypothesis (and potentially my counter below) is pure speculation and assumes one train per hour; wouldn’t there be at least two trains per hour each entering and exiting the Downtown San Rafael Station so barriers would be down four times an hour? – The same is true in Civic Center and every railroad crossing in Marin will be blocked for at least 6 minutes every hour just to transport a minuscule number of people more cost effectively served by a bus service causing no such delay. – in San Rafael / Civic Center adding a proposed 1,000 new residences to justify the train would “blow the freeway” – Paul Jensen, city of San Rafael planner’s words – (meaning loaded the 101 intersections to beyond capacity) so this number was reduced to 800; but this study DID NOT take into consideration the additional impact of train barriers cutting off Civic Center Drive 4 times an hour. Conveniently there are separate studies..
– Finally this is all kind of academic because for the last 2 days the SMART train lines have been submerged underwater and I don’t know if plans or budget allow for building embankments down Gallinas Creek and raising the ground at Civic Center/under 101 to mitigate this (not sure what the already concerned environmental lobby will think of this). This kind of oversight again underscores the likely massive waste of taxpayer dollars. Right you are on the frequency – it’s four trains per hour per intersection. I’ll update. I think it’s prudent, in the absence of concrete information from SMART, to use what we know about federal regulations and extrapolate from that what to expect. I’ve found that I’m led astray when I go beyond that – sometimes agencies act worse than I expect, sometimes they act better. Even SMART has been on the better-than-expected side every so often. If the gates are kept closed longer than required, we’ll have the analysis and data to show them why they don’t have to do that. I really don’t think the data we know calls for crying apocalypse, but a traffic impact study would be great to have anyway. A study should be done for both the Station Area Plans and SMART separately. Ideally, SMART would study the traffic effects using current development patterns, while the SAPs would study traffic effects assuming a train is integrated with neighborhood signal timing. Two small corrections: the SCTA travel data shows 89 people will drive to ride SMART but 329 will ride, not including station area plan growth. This is equivalent to a fairly typical MetroNorth or Long Island Railroad stop outside New York City. Second, the cost of the full line comes to about $700-750 million, not $1 billion. Tangentially, Alon Levy has posted a reasonable examination of whether ridership forecasts are optimistic or not. The latest studies he found showed that ridership optimism is no longer a major problem.